Under the High Chair: Thanksgiving Part 1: Turkey & Co.
Amy, this is going to be an enjoyable Thanksgiving ride. So it looks like Canadians celebrate Thanksgiving in much the same manner as Americans in terms of the food selections? 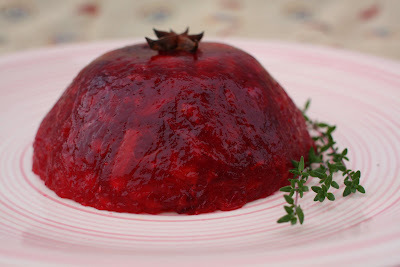 That cranberry sauce looks yummy!! I've never made a whole turkey myself. But I'm going to one of these years!! 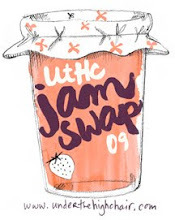 Everything looks great so far - good thing you had those extra cranberries! 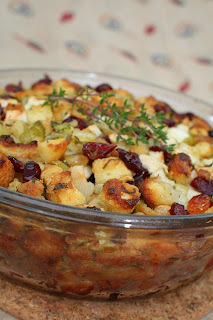 Oooh, your stuffing and cranberry sauce recipes are delightful!! Aww - your post makes me so sad that we missed Canadian Thanksgiving this year. We are lucky to usually get to celebrate 2 Thanksgivings, so that we have to be practically rolled to the table for Christmas. :) Your stuffing looks delicious! I love the colors and the addition of fruit! I am sure with you at the "helm" that dinner was fantastic! Happy Thanksgiving! 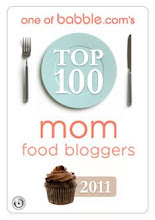 (Even though I am a few days late) Glad your Thanksgiving is before mine as I can enjoy some of your fantstic recipes! Yum on that dressing! I am so hungry right now and that stuffing looks amazing. I really wish I had some to try. I will just have to make some for myself!! 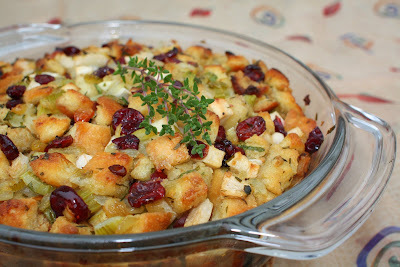 That stuffing looks great, and I love to mix fruit into savory dishes, so I'll be bookmarking. Your poor pot! I've done that so many times...I love the look of the stuffing! Hi deb- Left over turkey is the best part. I've been simmering a soup all day. 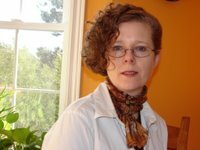 Hi Recipegirl- Many thank for stopping by! Hi Culinarywannabe- Sound's like twice the fun! Hi Jim- Thanks for the vote! Hi Lyb- Duck is what my parents usually serve--it's way more flavorful. Hope you post it! Hi Eat- You'll be happy you did! Hi Lydia- Great! Hope you try it out. Love the retro mold & its maple leaf garnish. I'm heading out to buy the mini-food right now, actually (and taking in lunch with a friend at the world-famous Shopsin's along the way--my first visit.) I'll see if I can find any Thanksgiving dinners in miniature. Glad it all worked out in the end! This is a beautiful Thanksgiving meal. Congratulations for winning. that's pretty much how i made my stuffing too! everything looks so beautiful. Oh, I like the maple syrup for basting... next time. this is awesome . . . lovely, i don't mind joining you the next time if there is a sit! lol! wow aimee! i dont even know what to say except- the food looks fabulous! and probably tasted fabulous as well.. and thank you for spending the time to document and share all this thanksgiving info. i know it takes a while to post everything and i just appreciate your time and creativity. 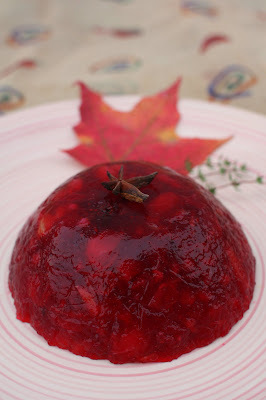 Love the sound of star anise in the cranberry sauce. 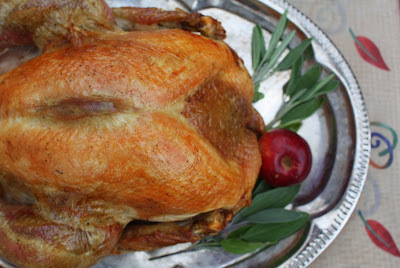 Your Thanksgiving dinner looks amazing. I have to try and brush the turkey with maple syrup - sounds delicious. And that stuffing! Maybe I will make turkey at Christmas just to try out your recipe. Hi Michele- A thanksgiving mini! How fun. Sorry I spelled your name wrong. It's been corrected. Hi Helene- Merci!I was pretty excited. Hi Kickpleat- Cool, thanks for the compliments. Hi Cheryl- Isn't everything better with maple syrup? Hi bigboysoven- You'd be most welcome! Hi Val- At least one doesn't have to buy presents! Hi Abigail- Why, thank you! That was sweet of you. Hi Caviar- It's pretty mild, but I love it with the orange. Hi Liliana- Thanks! I am hoping this can be a reference for some holiday cooking. Your Thanksgiving dinner looks great! 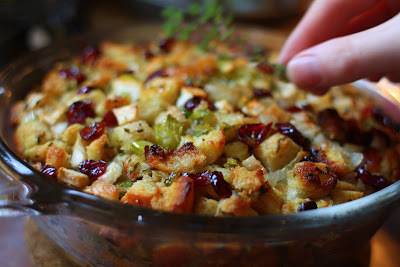 I wish I had thought to just bake the stuffing in a pan. Gosh, I wish I had a turkey leg to gnaw on right now. That's terrible about your cranberries! I do stuff like that a lot. I'm horrible with hot cereals in the microwave.